Alright, here we go. 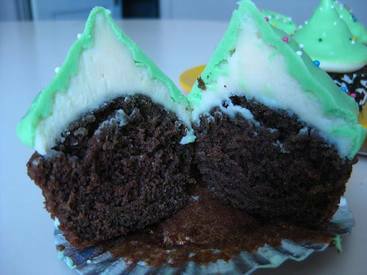 Continuing on with our St. Patrick's Day-Themed recipes, I bring to you these delicious chocolate-dipped cupcakes! A chocolate cupcake with cream cheese frosting, dipped in chocolate! What more can you ask for? I'd say this is a perfect treat to bring to your St. Patty's Day party!